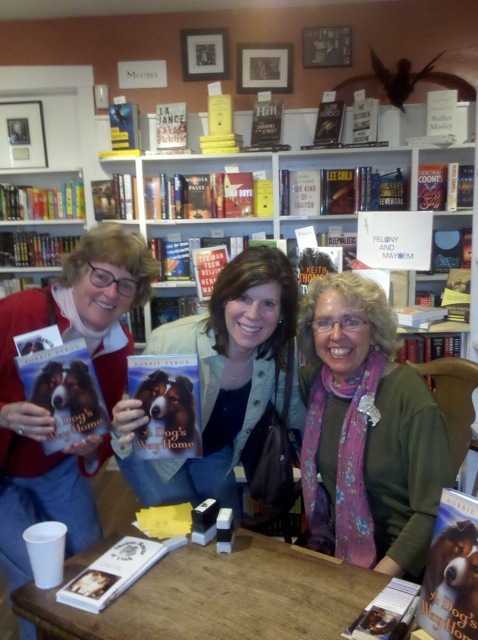 Fido and Friend in Five: Kathryn Erskine and Maxine! When Kathy Erskine's tender, gorgeous, funny, heartbreaking book Mockingbird was named the winner of the National Book Award for 2010, several of us in my library did The Happy Dance! Granted, it was a rather subdued Happy Dance because we were, after all, in a library. But celebrate we did because we all loved that book. It's a book I clutch to my chest when I'm talking to a young reader and say, "I love this book and hope you will too." And they do! So I felt so much pleasure (and surprise) when I received an enthusiastic "yes" back from Kathy when I asked her if she'd like to be spotlighted in Fido and Friends. 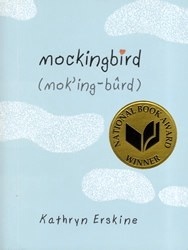 Her books have won every award practically known to man--National Book Award, ALA Best Fiction for Young Adults, Junior Library Guild Selection--I could go on and on. But you know what I've discovered doing this blog? It doesn't matter how "famous" they are or how busy they are, dog people have big hearts and they just LOVE to talk about their dogs! 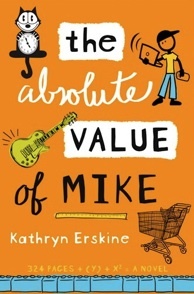 So without further ado, I give you the amazing Kathryn Erskine and the marvelous Maxine! "Um, can you come see this really sweet dog?" "At the animal shelter--I just happened to drive by--really--I didn't mean to!" Loud laughter on the other end of the phone. 2. What makes Maxine's tail wag? Family, friends, visitors, food, play, walk, run...basically life! 5. Look at door (message: "OUT, NOW!") next to my computer. Look at me. Look at door. Look at me. Repeat as needed. 6. Put snout under typing arm and flip hand off the keyboard, then smile and wag. It's hard to keep saying no after all that effort. 5. In five words, tell us what Maxine means to you: Joy. Enthusiasm. Loyalty. Love Sponge. Thanks so much for stopping by, Kathy and Maxine! Now get out for a good long walk. Fido and Friend in Five: Corinne Humphrey and Rudy! There's nothing more fun (in my mind) than an evening spent with good friends, talking endlessly about dogs and writing. And that's just what Corinne and I (and three other amazing authors) will be doing up here in Park City on the evening of April 30th. We will be part of THE literary event of the season when we talk books and dogs at "Authors Unleashed", a benefit for Friends of Animals of Utah. Corinne is one of my good friends up here in the mountains of Park City. There's no one who can light up a room the way she can. She's not just a dreamer, Corinne is a do-er! 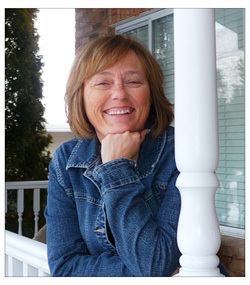 Several years ago, she retired from years of working as a stewardess for Delta airlines and threw herself in pursuing her dream of being an artist. Which she did with her trademark zeal and optimism. About that same time, she decided it was time to add a canine companion to her life. 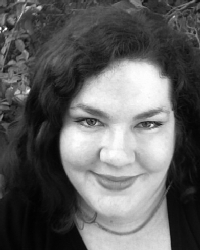 Not only did she find just that when she adopted Rudy, but she also found a muse for her work. 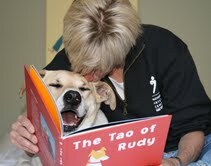 The end result was her self-published, multi-award winning The Tao of Rudy. After a couple of years of working her tiny tail off promoting her book, the The Tao of Rudy was bought by Chronicle Books. Now it has reincarnated into Shoot for the Moon, with new text inspired by her life with Rudy, accompanied by her wonderfully whimsical artwork. 1. How did you and Rudy find each other? 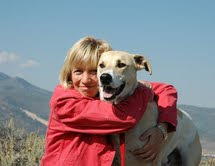 I'd made numerous trips to Friends of Animals of Utah's adoption center, "Furburbia", looking for a canine companion who "connected" with me. Rudy (formerly knows as Bob) was not my first, or second, or even third choice because he'd become kennel aggressive from being in a shelter for so long. The intuitive staff at Furburbia kept pitching him, saying, "Bob's our favorite!" and "...just take him out for a little walk." As soon as we got outside and away from the kennel, he leaned into me and gave me a look with such a mixture of hope and despair, that I was hooked. It's been love ever since! 2. What's your all-time favorite dog story? 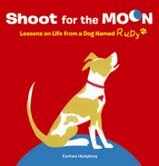 Mine and Rudy's books, of course, The Tao of Rudy and Shoot for the Moon: Lessons on Life from a Dog Named Rudy. 3. If Rudy could change just one thing about you, what would that be? I'd let him chase things! 4. What makes Rudy's tail wag? Rudy had been terribly abused, and then spent about three years in various shelters, so it took a year and a half before he wagged his tail. Now when we get ready for our daily walk, or his girlfriends come over to visit him, or I sing his song to him, "When you're happy and you know it, wag your tail," he not only wags his tail, he wags his whole back end! 5. In five words, tell us what Rudy means to you: JOY, love, loyalty, humor, and more love! 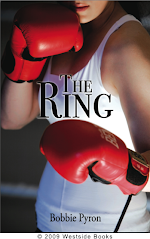 Watch for details about "Authors Unleashed" coming soon! Fido and Friend in Five: Anita Silvey and Lancelot! If you're at all associated with the wonderful world of children's books, you know who Anita Silvey is. 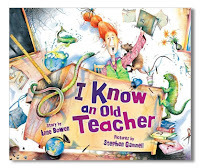 Doesn't matter if you're a teacher, librarian, author, publisher, or editor--you say Anita Silvey's name and folks smile and nod and say (rather reverentially), "Oh yes, Anita Silvey." And why not? She's done it all. 1. How did you and Lancelot find each other? I had been sharing my life with Lady, my ten-year-old Bernese Mountain Dog and decided it was time to add another Bernese to the family. It took me almost nine months to find Lancelot. Bernese are in great demand, and many good breeders only have one litter a year, if that. But finally, after I'd passed all the tests required by the breeder, I traveled to their home in Western Massachusetts to see the puppies, all one-month old. As I went to put my hand in the pen, Lance grabbed onto my finger for dear life. Then, when I picked him up, he started kissing me right away. That pup had moves! He had me, in fact, "from hello,' but was already promised to another. As I was making preparations to pick up my dog, the family who was to get Lance backed out. So he came home with me. A couple of months ago, when Lance began puppy kindergarten, he saw the trainer, walked over, and started kissing her. He's been her favorite ever since--and not because of flawless behavior! 2. What makes Lance's tail wag? Upon awakening in his crate, Lance executes a perfect Yoga "downward dog" and his tail begins to move. It continues all day, when I talk to him, when I pet him, or look at him. All food preparation interests Lance--he may want to become a sous-chef--and his tail wags continuously when I'm in the kitchen. At the sight of Lady, his tail goes wild--he is hopelessly in love with her. 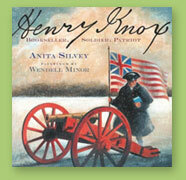 For some reason, the music "Boston Patriot" for the trailer of my book, Henry Knox, sends him into ecstasy. Who knows why. 3. 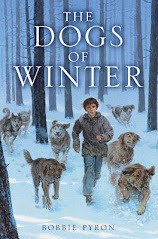 What's your all-time favorite dog book? 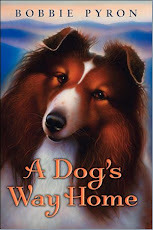 I love lots of stories, as long as the dog doesn't die: Lassie Come-Home, Because of Winn Dixie and The Incredible Journey. As you know, I am also a big fan of A Dog's Way Home (blush). Tam reminds me a bit of my Berners. 4. If your dogs could change just one thing about you, what would that be? Both Lady and Lancelot would be happier if I took many more, and longer, walks, and did not stare at the computer so much. But they support me in my insanity. 5. In five words, tell us what your dogs mean to you: Companionship, joy, balance, acceptance, and love. 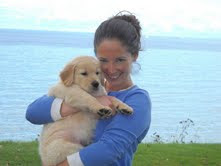 Fido and Friend in Five: agent Jennifer Laughran and Moxie! 1. 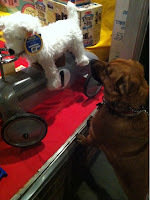 How did you and Moxie find each other? I never had a dog of my own before, only cats. I was even a little scared of dogs. But still, I always wanted one. When I lived in San Francisco my lease didn't allow me to have a dog, plus I had zero outdoor space. But then when I moved to the Hudson Valley, I had a huge yard just begging for a pup! I decided, since I wasn't even sure I could handle a dog, that I'd try fostering. The rescue organization (Perfect Pets Rescue in Red Hook, NY) matched me up with a little part corgi-part lab named Macadamia. That was sort of a mouthful, so I renamed her Moxie. And every time someone came who wanted to adopt her, I would find some flaw in them (too active! not active enough! )...so obviously it was meant to be, and I adopted her myself! 2. What makes Moxie's tail wag? Moxie loves bacon, marrow bones, and going on nice long walks. Come to think of it, so do I! 4. 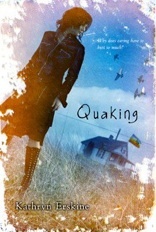 If Moxie could change just one thing about you, what would it be? She would probably make me work less and play more. 5. In five words, tell us what Moxie means to you: Bed warmer, comedian, best friend! 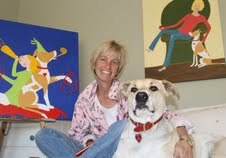 Fido and Friend in FIve: Anne Bowen and River! a little better in today's spotlight! 1. How did you and River find each other? My son and his wife asked me to take care of River for a few days, then a week, two weeks and soon, River and I became inseparable. As their lives became more involved, my son's family agreed to let me adopt River. It was a good situation for everyone. They could see River whenever they wanted and River and I could see each other all the time! 2. What makes River's tail wag? When River sees me putting on my running shoes, he knows what's going to happen next. He stands at the door, arffing and aaaroooing, which means, "Hurry! Let's go outside now!" The two of us in the outdoors beneath a blue Utah sky makes us both very happy. 3. What' your all-time favorite dog story? It's not really a story. It's a poem by Mary Oliver, and I think she captures the essence of dog so well. Here's a few lines: "A dog comes to you and lives with you in your own house, but you do not therefore own her, as you do not own the rain, or the trees, or the laws that pertain to them. A dog can never tell you what she knows from smells of the world, but you know, watching her, that you know almost nothing." 4. If River could change just one thing about you, what would it be? 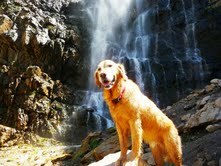 It would be that all I ever do is run or hike with him by my side. We's also stop for a bone along the way. watch for her River-inspired book, Scooter in the Outside ! 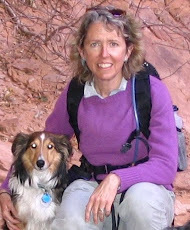 Fido and Friend in Five: Patricia MacLachlan! 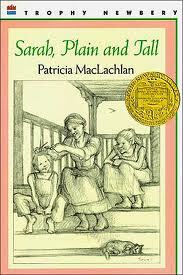 Yes, dear reader, you read that right: Patricia MacLachlan is on my blog! Besides being an amazing writer of books that have become classics, it turns out Patty is a dog person. And so it only seemed natural for my most excellent editor of A Dog's Way Home to ask her to read my book and, if she liked it, to write a jacket blurb for it. So she did, and she did! 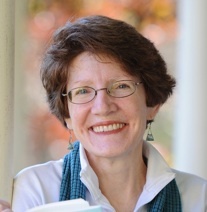 Do you know what it feels like to have Patricia MacLachlan say she "just loves" your book? I'll tell you: it feels like a million balloons carrying you away. 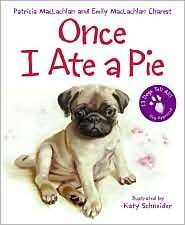 Besides her beloved Sarah, Plain and Tall, Patty has also written many other books including two books of poetry for kids about dogs: Once I Ate A Pie and I Didn't Do It. I just LOVE those two books! They so perfectly capture the thoughts and feelings of the dogs. Even with how busy Patty is, she was most willing to take time out to talk with me about her (and her family's) long-standing love for animals and her dogs, Emmet and Charlie. 1. How did you and your dogs find each other? Ahh, dogs. I have never been without dogs. They are in my history, my parent's history, and their parents. I was, in truth, named after a favorite dog of my mother's! My oldest son, who's lived and worked in Africa for twenty years (with Jane Goodall) moved into a house with seven dogs. My middle son works in publishing, so he doesn't have a dog right now, though in his he wants at least two beagles. My daughter Emily, with whom I wrote Once I Ate A Pie and I Didn't Do It, two picture books about dogs we know and love, has had three rescue dogs in the past years. She has a rescued Great Pyranees who is the sweetest dog I've ever known, even though he's about 150 pounds! She also has a Texas hound. Neo, the Great Pyr, is in a new novel I have coming out called Waiting for the Magic. 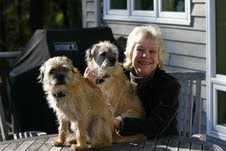 I have two Border Terriers named Emmet and Charlie. I've had them since they were puppies. 2. What makes Charlie and Emmet's tails wag? Food and people make their tails wag! They love all people and their dogs. They also like to watch TV. They've been known to howl at Oprah. 3. If Charlie and Emmet could change just one thing about you, what would it be? It would be that I have a certain nervous problem that makes me drop food all day. She was not the sunrise. She was not the sunset. Thank you Patty and Emmet and Charlie! MORE Party Photos and a Video Clip! Here's a few more photos and more from the launch of A Dog's Way Home at The King's English Bookshop on Saturday! Thanks to Barbara Edelberg and Sheltie Rescue of Utah for the photos and video clip! Me and the Sheltie Gang! 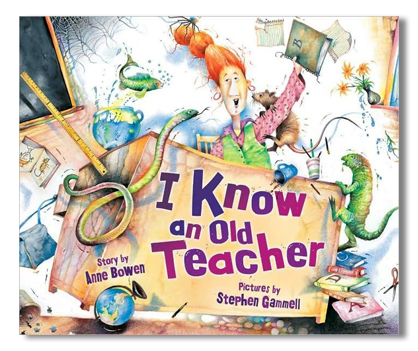 Book Launch at the King's English! 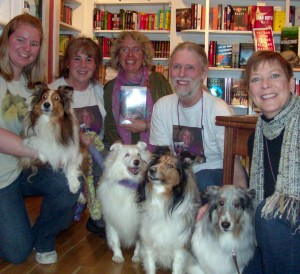 Saturday was the official launch of A Dog's Way Home, hosted by The King's English Bookshop in Salt Lake City! Rachel (both of them) and Anne did a wonderful job setting everything up and making me and all the shelties feel welcome. First of all was this amazing cake! Yes, that's actually icing that makes up the cover of the book. Despite my reservations, no one had trouble eating Tam's head :) My friend, Susan Hamada and her rescued sheltie, Chloe, introduced me to the standing-room-only crowd, and Barbara and Jim from Sheltie Rescue of Utah brought two of their sweet shelties looking for forever homes. I talked a bit about what inspired me to write A Dog's Way Home and the trials and tribulations along the way. 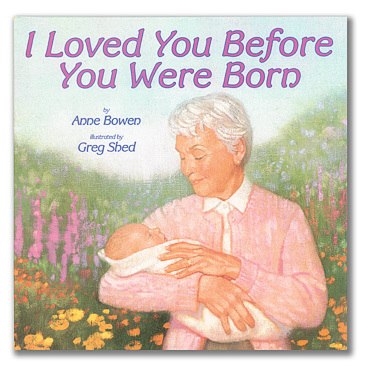 And then I dove in and read from the book. I did see one or two people out of the corner of my eye wiping away a tear. And then came the signing! Folks were lined up throughout the store. It was gratifying! I got to see old friends and make new ones! I finally got to meet Shanna and her amazing service dog, Holly who I posted about earlier on my blog. They are both so inspiring! And check out those T-shirts on Barbara and Jim! Thanks so much to everyone who came out and made the launch of A Dog's Way Home a tail-waggin' success! 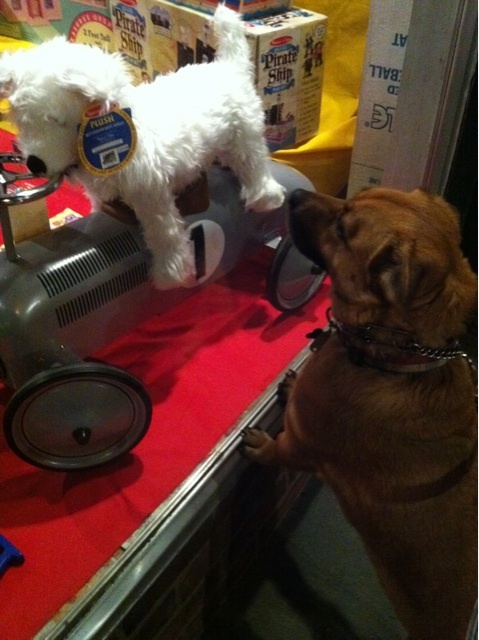 Fido and Friend in Five: Brenna & Fozzie! 1. How did you and that cute little Fozzie find each other? After many years of wanting one and having moved to an apartment on the ground floor with outdoor space, my husband and I decided the time was finally right to get a dog. A puppy, in fact! 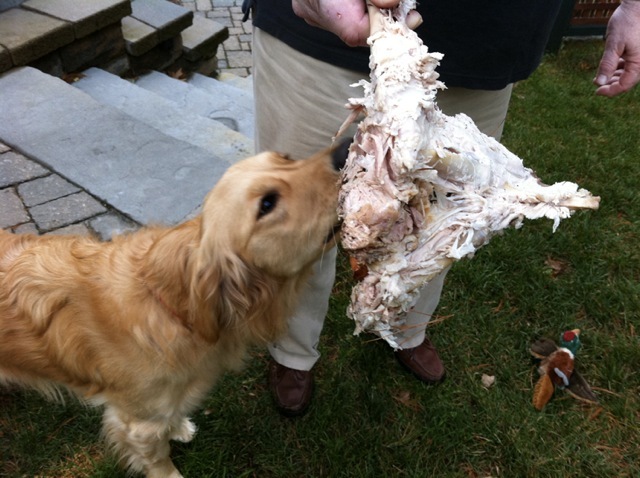 Having grown up with a golden retriever in upstate New York, a family friend referred us to a well-known and well-respected golden retriever breeder whose dog was expecting a litter of puppies in the fall. When the time finally came, we traveled five and a half hours by car to pick up our little eight-week-old Fozzie Franzitta on Sept. 26, 2010. And from that day on, our lives changed forever in the best possible way! 2. What makes your dog's tail wag? Oh, what doesn't make his tail wag?! Fozzie loves life. His favorite part of the day is when I get home from work--he virtually throws a party, he's so excited! He also loves, in no particular order: people, children, squirrels, the park, "cookies", his favorite stuffed animal, Zebra, bananas, his mom and dad, his best friend (and fellow GR) Shelby, and of course, tennis balls! 4. If Fozzie could change just one thing about you, what would it be? 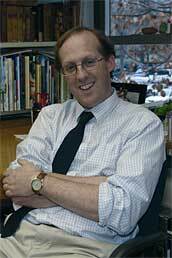 I think he'd change my schedule so I never had to leave him. 5. 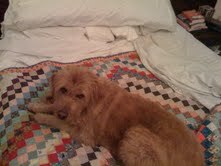 Tell us in five words what Fozzie means to you: Fozzie is my first child. 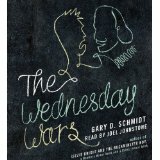 Fido and Friend in Five: Gary Schmidt! 1. How did you and your dogs find each other? We went looking for border collie. We found one litter--and chose him because he would have been killed since he didn't have the desired markings--he has one blue eye and a brown eye. Then, when we were about to leave, we learned that another also didn't have the desired markings--a white collar that extends fully around the neck--and se we took him too. 2. What makes your dogs tails wag? Surprisingly, not all that much. Border Collies are very judgmental. So, walking into the room at first light--that will set tails wagging. Asking if they want to go for a run. That, too. But they won't wag for food, or for mere entertainment. 3. What's your all-time favorite dog story? (I am sorry to say, Gary is not a fan of novels about dogs, except, I'm happy to say, mine). Never liked the Lassie stories. They always seemed to revolve around the fact that Lassie couldn't communicate to the stupid adults that Timmy was in some sort of dreadful trouble. If you want a story, how about the border collie just written up in the NY Times who has a vocabulary of over a thousand words! Not bad! 4. If your dogs could change just one thing about you, what would it be? I would be home all the time, and running them all the time, and finding some sheep for them to herd. 5. In five words, tell us what your dogs mean to you: Health--physical, emotional, aesthetic, social. 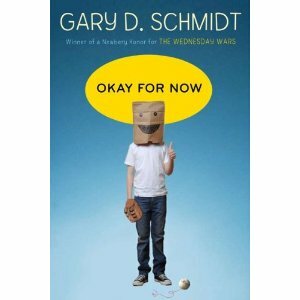 Okay, now you can watch the book trailer for Gary's new book, Okay for Now. You'll get to see Gary practically cavorting with his border collies on the beautiful farm they share with Gary's wife and kids in Michigan. 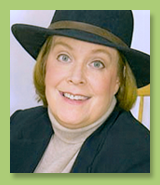 Fido and Friend in Five: Barbara O'Connor! write with great longing and affection for that part of the world. Barbara is also a proud mother of two lovely (although sometimes naughty) dogs, Ruby and Mattie. I'm sure it's her love of dogs that led her to write the multi-award winning book, How to Steal a Dog. 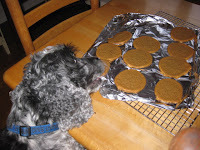 As you'll see from the photos of her own dogs, they're the ones who sometimes do the stealing! 1) How did you and your dogs find each other? 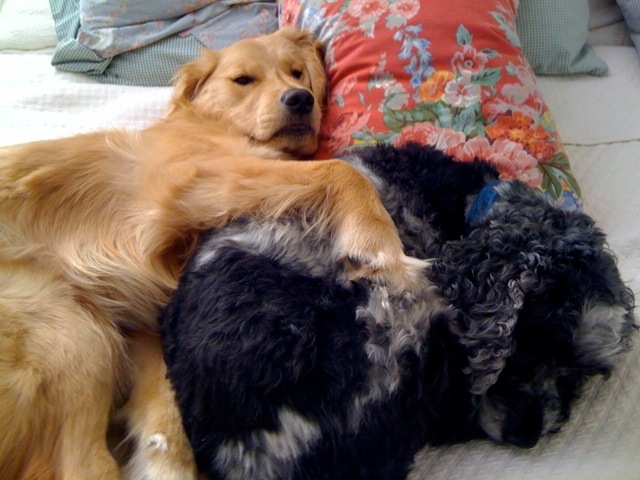 I have two dogs, Matty (a 12-year-old English cocker spaniel) and Ruby (an 18-month-old golden retriever). We got Matty for my son when he was nine. He picked him out and they were inseparable until my son went off to college (sniff sniff). It was just like the book, My Dog Skip! I got Ruby after my beloved golden died of brain cancer. I love goldens and needed another one. 2) What makes your dogs tails wag? Matty: Food, food, food. He has a little stub of a tail that shakes his whole body when he wags it! He wants to eat all the time. Ruby: People, people, people and dogs dogs dogs. She loves every person she meets and every dog she meets. 3) What's your all-time favorite dog story? Shiloh by Phyllis Reynolds Naylor. Love it so much! (and I've heard How to Steal a Dog is not bad, ha ha). Ruby after the Good stuff! 4) If your dogs could change one thing about you, what would it be? Hmmmm...they would probably make me more patient. I definitely need to work on that. They would also want me to feed them 24/7--and good stuff, like beef tenderloin. 5) In five words, tell us what your dogs mean to you: Love, comfort, humor, devotion, trust. Thanks Barbara, Maddy and Ruby! Fido and Friend in Five: Sydney Salter! 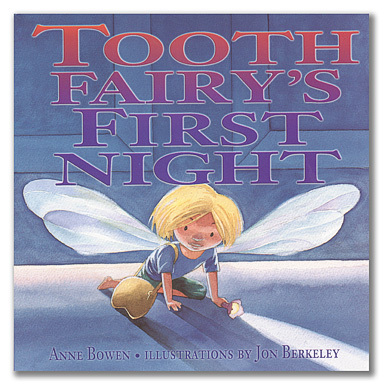 Tam and Abby's Journey Begins!